Hershell Shull’s official title may be stud manager of Farnley Farm, but the careful attention he pays to every pony is obvious. Photo by Abby Gibbon. 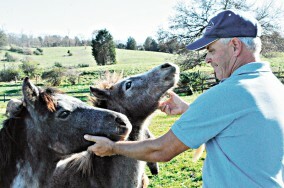 After 30 years spent managing and showing Welsh and Dartmoor stallions, Shull can’t envision a future without ponies. Hershell Shull leads me into a field of yearling ponies. Soft roans, fuzzy bays and winter grays look up as we walk toward them, their tails swishing, interested. A few take a first step in our direction, and within moments they’re all ambling as a herd: not rushed, just eager. Immediately I find myself shifting my camera behind my back—nibblers, I bet— but when we’re surrounded (Shull first, then me), I discover that the ponies are polite. Mannered, even. They nuzzle, don’t bite, mostly just watch as I reach out to scratch one on the crest. The others don’t push. Shull, surrounded by a fan club, is rubbing chins that have been raised in his direction. I lift the camera to snap a few shots, all the while wondering: Can these really be pony yearlings? “Did he call them over for you?” Hetty Abeles, owner of her family’s Farnley Farm, asks when we’ve walked back downhill to the barn. I explain that it wasn’t necessary; the ponies saw us and walked right over. Shull smiles and nods modestly. In the small paddock beside the barn, two ponies have been watching us eagerly from the gate. Thirty years ago, Hershull Shull moved to Farnley Farm in White Post, Va., without any idea what he was in for. He’d been working on a cattle farm in Berryville, Va., when family friend Ed Simpson let him in on a job opening. In 1936, Dunning and her first husband, Alexander Mackay-Smith, voyaged to England and brought several Welsh and Dartmoor ponies back to Virginia via cargo passage. Over the next few decades, they made additional trips, bolstering the stock that would establish both breeds in the United States. Dunning’s eye for conformation and temperament, evident in stallions like the venerable Farnley Lustre (Gretton Blue Boy—Cui Glitter, Rebel Revolt), soon made ponies with Farnley-prefixed names the rage in hunter rings, favored for their floating movement and kid-friendly demeanors. Shull, too, brought his family along when he moved to Farnley. His wife, Karen, accompanied him when he accepted the job. Both 19 when they moved to Farnley, neither had much horse experience, but they hung on every piece of advice Dunning had to offer. Today, spring and summer breeding seasons find Hershell with his hands full. Hershell estimates that Farnley’s 14 stallions, including multiple-time Welsh Pony and Cob Society of America supreme champion Farnley Triton, covered about 60 mares this season, including ship-in clients and Farnley’s own broodmares. Farnley Farm spans 600 acres, and in addition to overseeing breeding operations and occasional on-site pony auctions—including this summer’s auction in which 63 ponies were sold—Hershell takes pride in contributing to the farm’s upkeep, including mowing, trimming, chopping wood and maintaining pastures for both horses and cattle. But amidst all the hustle and bustle of farm life, raising their twin daughters, Megan and Stephanie, born in 1984, has been the Shulls’ crowning achievement. Spring through fall, you’ll find Hershell and Karen showing ponies and stallions at breed shows up and down the East Coast, including Maryland and Virginia Pony Breeders Association shows. But unlike breeding management, for which Hershell felt initially unprepared, showing in-hand came more naturally. Abeles, who took over ownership of the farm when Dunning, her mother, passed away in 2009, attributes Hershell’s success to more than just speed. For Hershell, good behavior is the most basic requirement for all of Farnley’s breeding stock. Does he have a favorite among the stallions? “Triton is a favorite,” he said with a gleam in his eye, then rattled off a list of others—Farnley Magic Word, Farnley Magic Flute, Cowboy Joe, Count Bisbee—making it clear he can’t play the favorites game. Affinity for Hershell is equally as strong in the Welsh Pony community. When breeding and show season end, Hershell gives the stallions a 30-day break before turning them out together in a field behind his house. Abeles takes comfort in knowing that Hershell can look out his window to oversee the herd. “He has his eye on them all the time, and it’s a peaceable kingdom,” she said, noting that she’s come to rely on Hershell for a variety of tasks over the years. Though Hershell and Karen’s daughters are now grown with children of their own, their granddaughter, Madison, who just turned 3, competed in her first leadline class this year on Farnley Couscous. And Hershell, an old hat in the breeding business after 30 years at Farnley, can’t envision a better setting. If you enjoyed this article and would like to read more like it, consider subscribing. The original version of “Stud Manager Hershell Shull Finds His Niche At Farnley Farm” ran in the Dec. 5, 2011, Stallion issue. Check out the table of contents to see what great stories are in the magazine this week.